Now that we have entered March, it time for Everest climbers to get focused, time to get serious about the last minute preparations. Since their dream began, they wondered how this period would feel. They have been saving money, buying gear, training their body but a few important steps remain before boarding that plane for Kathmandu. How do you keep sleeping and keep mental focus 20 days before leaving for Everest without stressing yourself out? Focus on “leaving nothing unsaid” with those who matter most in your life, visualize being on the mountain with a positive outcome, review your gear continuously using a mental walk-thru of the climb to make sure you have everything you need and want, and finally surround yourself with positive people who have fun, laugh and support you. In my last post, I discussed the final steps in training, gear and being prepared for summiting but let’s take a closer look at three areas: Physical, Mental and Emotional. With three weeks to go, this area is greatly simplified from a year ago. Bottom line – don’t get sick, don’t get hurt. The time for pushing your limits has passed. Now is the time to let your body rest. Get as much sleep as you can. A restful sleep is when your body heals itself and restores. You will not sleep as well during your expedition as you do at home so take advantage of these last few weeks. Having the right attitude is crucial to a successful expedition. First, clear off all the items on your todo list now, don’t wait until the last minute. If you have been putting off buying snacks, that last piece of gear, making sure your cell phone works with the NCELL network – get ‘er done. This is the time to get everything at work in order. Train your replacement, talk to your boss, make sure there are no loose ends and no surprises that will haunt you during the climb. Two months is a longtime way from work. If something blows up in week five, there is nothing you can do about it from Everest, but you can make sure you have done all you can now, before you leave. But don’t over do it. Trust those you leave behind to do the right thing. If you don’t, you probably shouldn’t be going. If you are a list person, make a list and celebrate checking off the items. If you keep everything in your head, consider using lists to clear your brain for more important subjects. Having these monkeys on your shoulder only weighs you down and distracts you from what is most important, preparing yourself emotionally. This is probably the most important of these three areas. My simple advice: leave nothing left unsaid. I’ve written about this philosophy for my own climbs and about Everest for over a decade and it remains the best advice I can give anyone leaving for Everest. I remember overhearing a teammate on an 8000 meter climb literally yelling at his soon to be ex-wife about divorce terms. Not only was he seriously upset and distracted but it brought a wave of negativity over the entire camp. Another teammate was intent on complaining about her spouse and how she was misunderstood. While she may have felt better, the negativity was unnecessary and not helpful to everyone else. Everyone has emotional baggage they carry with them, but an Everest expedition is not the time or place to resolve them. Your Everest teammates are not your theaparists. Now, this week, is the time to begin to get closure. No you cannot solve years long issues in a few days but you can try to get agreement and closure on some areas. Now is the time to have a family talk about your climb. Get everyone together in the same room and talk openly about the schedule, what to expect, when you will call or send an email. Set expectations so you minimize surprises. And remember to tell everyone that no news is not bad news, it is just no news. Make sure that everyone knows Everest Base camp is remote and communications is spotty, regardless of what they may read. If voice to voice live communications is important to you, buy or rent a Thuraya or Iridium satellite phone. It is the only method you can 100% count on from anywhere on the mountain. Yes, it is expensive but hearing your loved one’s voice after a disaster like an avalanche or earthquake is beyond measure. If you have parents that live far away, take time to call them, listen carefully to their fears. Talk them thru everything. Of all people, they most likely don’t understand why you are climbing. This is not the time to argue, it is the time to listen and tell them that you understand that they don’t understand and that you love them. Talk about your summit night, when you will leave. Calculate the time difference so they are clear if you say you are leaving High Camp at 10:00 pm, what time that is at home. Talk about it may take 12 to 20 hours before they might hear anything. And talk about your guide or logistics service and what they post on the web. Most importantly, talk about the lack of communications that always occurs during this time. If you will use a GPS tracker set expectations that batteries go dead, the devices are not 100% accurate so again, don’t jump to a conclusion when something looks odd. Talk about what they might read on the Internet and how the press loves to post stories about climbers in trouble and death on the mountain. Set up a support system if something does go horribly bad. It is OK to talk about problems and what to do. Make sure your spouse, partner, significant-other knows who to contact in case of an emergency. If you are going with a well established western company, they will probably provide a contact available 24 hours a day. If you are climbing with a small outfit, or one of the Sherpa based guides, double and triple check how to get in contact with them in case of an emergency. This is one area to make sure there is no confusion. If you have an email or a phone number for your guide service, ask how often it is checked and by whom. You might be surprised to learn it is monitored by the same person you are climbing with and if you are both at Camp 3, that means no one will answer the phone or respond to that email. If someone close to you is currently ill, be clear on what information you would like to receive if things turn bad. Don’t leave it up to those at home to guess. Talk it over now, face to face. But it gets harder. Make sure your “person” knows exactly what your decision is should something happens to you on the mountain. If you die, do you want your body to be returned home, if it possible and you can afford it? If not, are you comfortable being left on the mountain forever? Are your loved ones comfortable with your choice? But this is the most important emotional step of all. Have a conversation with the one person in your life that matters the most to you. Be open, candid, honest. Tell them how you feel. Share with them your dreams, your hopes. Listen carefully as they tell you their fears, what will keep them up at night. 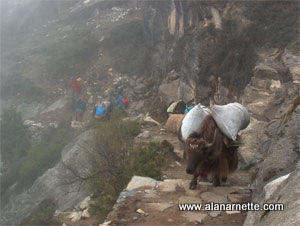 While you may be on the mountain, they are climbing with you each step of the way back home. You have the advantage of knowing what is going on, they can only guess and sometimes they will guess wrong. Often there are no answers to these fears, these dreams, but talking about them together will help you feel closer when you are lying in the tent at Camp 4, with the wind howling and the temperature dropping. You will remember that conversation forever. Surprise your climber and your loved one with a short video message left on their phone that they can watch before heading toward the top of the world. Your confidence and energy will touch them in ways you never imagined. And for those left at home, they will draw on that conversation as they struggle to go to bed on your summit night. It might have been days since they last heard for you and this conversation will be the strength from which they draw, the comfort as they replay your voice in their mind. Climbing Everest requires a team, and part of your team is at home.